The campers slowly creep up the trail toward Squirrel Cabin. They have their camo, a smidge of face paint, and a few wildly waving flashlights. But the woods are dark and the tube hill seems awfully far away. Will they be able to reach the checkpoint before one of the counselors catches them? Suddenly, out of the darkness, a figure dressed in white leaps from the porch of a nearby cabin. “Ninja Flash!” He yells as the bright glare of a portable camera flash blazes through the night. The campers are disoriented, they’ll never make it now. But they’ve forgotten the dark Ninja. He steps from the forest and stands between the discombobulated campers and the bright flash of the white Ninja. Gently he guides them past every danger, up the tubehill, and to the checkpoint so they can collect points for their team. The white Ninja struck again, but the dark Ninja was waiting. Whether it is leaping out of the forest to combat the evil machinations of the white Ninja, helping a little girl with a twisted ankle limp back to the lodge, or allowing someone to pick his nose during cabin skits for dramatic effect, Shinobi is always ready to lend a hand or nostril. So where did our resident Ninja come from? Shinobi has been coming to camp since he was a nine-year-old camper, the year before Scruffy was hired. His counselor, Zucchini, wrote him a letter between camps one year. “It meant a lot for me and was a big part of me coming back as a camper.” Later, after watching Zorak his older brother devote his summers to serving as a camp counselor, Shinobi decided to make that sacrifice as well. Shinobi has counseled for many years and done every other job imaginable from dish pit crew to paintball ref. I asked him why he keeps coming back, why he remains available for Scruffy’s late night calls for just one more dishwasher or experienced guy counselor. Dedicated to making nightgames memorable, sharing the gospel in a way that children can understand, and ensuring that camp is a place where kids know they are safe and loved, Shinobi has ghosted through camp and made it so much better for having its own Ninja. Our bi-annual work retreats are vital to the running of Camas Meadows Bible Camp. 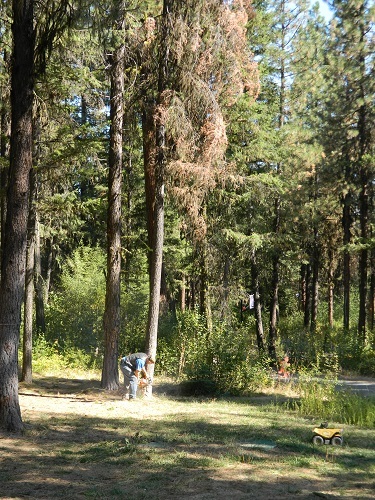 This year workers faced many difficulties, including but not limited to, axes and splitters and lawnmowers breaking at vital junctions and a burn ban that kept us from using chainsaws out in the woods away from the camp. But despite all of that, much helpful work occurred. I personally am thankful that Roger Webster was able to fall three dead trees from the staff house yard. This will help stop the spread of destructive pine beetles, keep our house from being smashed by falling timber, and make us feel a whole lot more secure during wind storms. Thank you so much everyone who came to help. You make Camas better every year. We couldn’t do it without you!